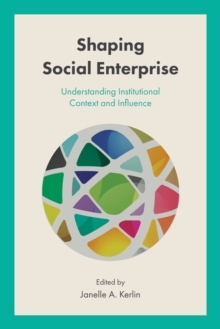 `Shaping Social Enterprise' offers the first tested framework that helps identify institutional influences affecting social enterprise. For well over a decade, scholars and practitioners have known that social enterprise looks different in different contexts but few have attempted to understand why. Kerlin's work in this area is the first to consider the influence of large institutions such as government, economy, civil society, and culture on the development of social enterprise. This book provides an in-depth assessment of Kerlin's theoretically-based framework for understanding these institutional and other influences by means of quantitative analysis as well as qualitative critiques from eight countries that help validate and refine it. The concluding chapter offers a revision of the framework based on the critiques. New features include more attention to culture and micro- and meso-level forces as well as the introduction of optional framework components that address rarely occurring country situations. Two new social enterprise country models are also added and new applications of the framework are detailed.